Autographed and Out of Print! 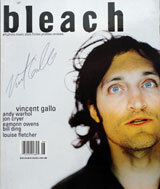 This hard to find magazine features Vincent Gallo on the cover. A four page spread includes an interview with Gallo as well as color photographs. Cover is autographed by Vincent Gallo.